Taste test: Wow, these chips are awesome. At first I thought they were going to be an Irish version of excellent, thick, wide-rippled McCoy's chips made in England. But these might be even better. These aren't quite as thick as McCoy's, and the ripples aren't as pointy, but that could be a plus in this case, as the particular combintion used here just might make these the crunchiest chips in their class. They're very crisp and have a generous amount of excellent oniony and cheesy flavoring on them. 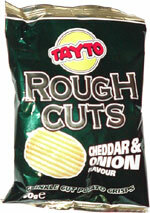 They're a clear standout among the various cheese and onion chips sold in Ireland. 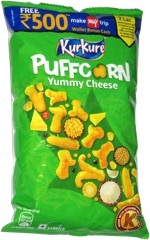 It's well worth a trip to Ireland to get your hands on a bag of these. Smell test: Nice mild oniony/cheesy smell.